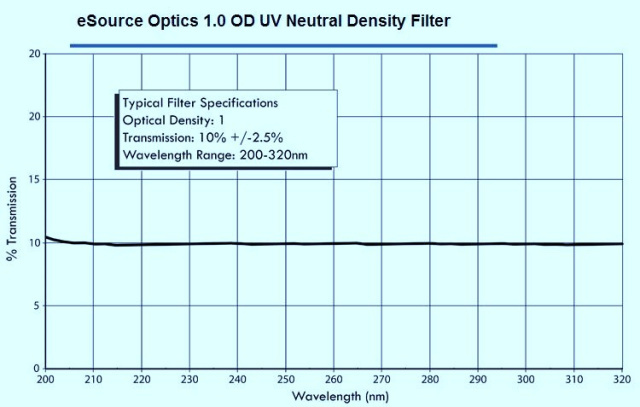 eSource Optics UV Neutral Density Optical Filters are available with Optical Densities (O.D.) ranging from 0.30 to 4.00 over the broadband UV wavelength range of 200m to 320nm. 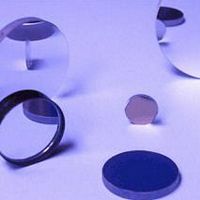 eSource Optics UV Neutral Density Optical Filters are Metallic Aluminum & MgF2 Thin-Film Filters that achieve the desired optical density or attenuation of UV light via a combination of reflection, transmission and absorption. 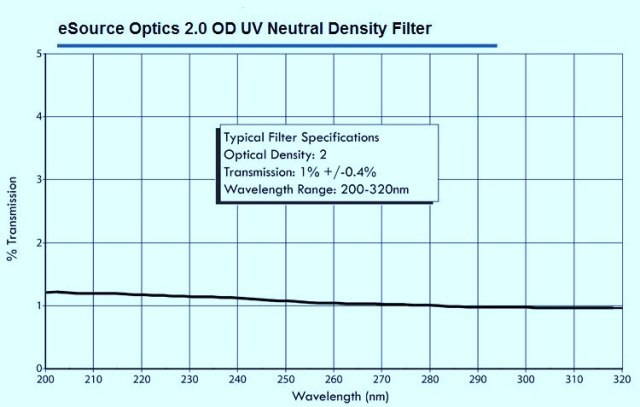 Unlike traditional Inconel Thin-Film ND Optical Filters that have too much absorption in the UV, especially below 250nm; all eSource Optics Al & MgF2 designed UV Neutral Density Optical Filters uniformly attenuate the intensity of transmitted light over the broadband UV wavelength range of 200m to 320nm. All eSource Optics UV Neutral Density Optical Filters are available in standard 12.7mm, 25.4mm, and 50.8mm Diameters and are manufactured using high purity UV grade Fused Silica substrates for UV wavelengths 200nm to 320nm. 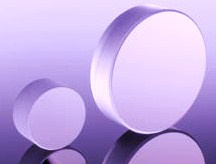 All UV Neutral Density Optical Filter substrates are highly polished to a <=40-20 scratch & dig surface quality. UV Neutral Density Optical Filters are supplied with a UV Fused Silica cover window that is edge sealed to the Open-faced UV ND Filter. Please refer to the link for more information on covered & edge sealed . UV Neutral Density Optical Filters can also be special ordered as Open-Faced UV ND Filters; contact us for more information. Optical Density (O.D.) Tolerance: ±10-15% of O.D. Availability: eSource Optics VUV-UV ND Filters are supplied on a per order basis; lead-time is typically within ~3-4 weeks. All eSource Optics UV Neutral Density Optical Filters are supplied with individual % Transmission Calibration Curves detailing normal incidence broadband UV spectral performance characteristics. These ND Optical Filters are typically used in applications such as calibration filters for low power UV lasers and VUV-UV Spectroscopy & Ellipsometry. eSource Optics UV Neutral Density Optical Filter Coatings can also be supplied in custom sizes and applied to Customer Furnished Material. Please contact us.